I'm excited to tell you that the last section of my updated Spring Fun Freebie has a new printable worksheet for sorting what belongs in spring time. You can download it here. Every month you can get a complete, free packet for basic skills by stopping here for Freebie Friday. My newsletter followers get the complete set in one download to make their lives easier! Going to the playground definitely belongs in spring! This activity packed literacy set build vocabulary for playground equipment and actions, spatial concepts to answer Where questions, and a variety of worksheets to make your mixed groups easier! 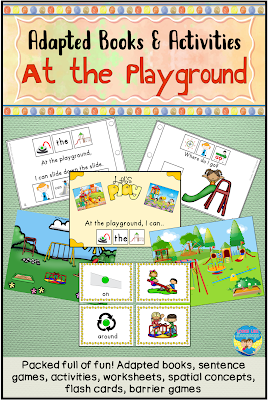 Check out At the Playground at my store.